Jackson Lanzing & Collin Kelly are writers with a decade of experience in a variety of mediums, from features to animation to comic books. As comics creators, Lanzing and Kelly have written for DC Entertainment, BOOM! Studios, and IDW on titles including Batman & Robin Eternal, Grayson, and Hacktivist. This year, they released their first creator-owned comic at BOOM! 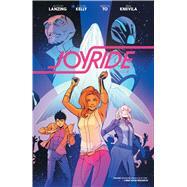 Studios, the critically-acclaimed ongoing teenage space adventure Joyride. Marcus To is a Canadian artist and illustrator whose credits include Cyborg 009, Red Robin, Huntress, Soulfire and The Flash. Born in Red Deer, Alberta, Canada, he has been a part of the American comic book industry since 2004. To lives in Toronto, Ontario and is a member of the Royal Academy of Illustration and Design. You can follow his adventures at MarcusTo.com.